[et_pb_section][et_pb_row][et_pb_column type=”3_4″][et_pb_accordion admin_label=”Accordion”][et_pb_accordion_item title=” What’s So Important About Feb 28th…?”]Saturday, Feb. 28th is the FIRST day of our league wide open practices and clinics. 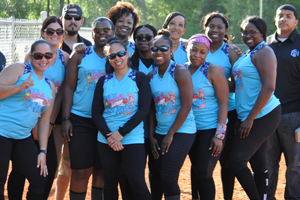 We’ve come realize that most of the ladies that come out to play kickball with us, although they may have been athletic, they may have NOT played this sport or ANY organized sport in years. 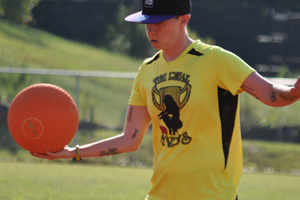 As a result, our Kickball Clinics & Workouts are designed to get women acclimated to being physically active again, and to teach techniques & rules of the game. They will be held at Ronald Bridges Park, and are set to begin Sat. Feb 28th, and EVERY Saturday thereafter until April, prior to the start of the season. NO! Everyone who pays will be DRAFTED to a team and will play! coaches will PRIVATELY select players for there teams. Thereafter, we will have a DRAFT party where the selections will be revealed. So NO school yard type selection process. Well, not publicly. 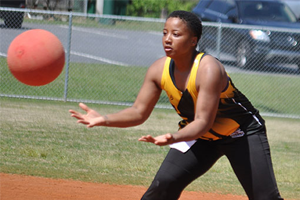 The $75 registration fee contributes towards the operating cost of the league. That includes but is not limited to the following: Draft Party, Jersey Ceremony, Game Day Barbecue, Cash Prizes, Championship Trophy, Player Trophies, League Tournament, End Of Year Banquet, Marketing/Promotion, Insurance, and more… However, it is NOT nearly enough to fund the TOTAL cost of operating the league. Yes. 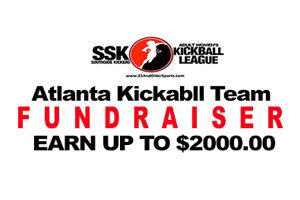 If For Any Reason 25AndOlder Sports Cancels The “South Side Kickers” Spring, Summer Or Fall Kickball League, We Will Guarantee 100% Refund Of Your Deposit Or Payments! Consolidation Of Parks Does Not Constitute A Cancelation. Delays in a leagues start date, also does not constitute a Cancelation. Delays are regarded as a part of development. No Refund If You Cancel. Your personal circumstances may change so keep in mind that you will not be provided a refund. Please consider the following possibilities before you register as they do not entitle you to a refund. ***** Job Transfer, Job schedule change, Moving, Injury, Divorce, Babysitter got a better offer, Not having fun, etc, etc, etc… Due to various considerations, 25AO Sports does not allow you to substitute a player in your place. If a player has a concern, it is their responsibility to notify us via email or in person. Do You Have A Refund Policy? Yes. If For Any Reason 25AndOlder Cancels The Urban Paradise Weekend, We Will Guarantee 100% Refund Of Your Payment! ALL Payments/Deposits made to us are Regarded as DEPOSITS and are NON REFUNDABLE!! No Refunds If… Your personal circumstances change. Please consider the following possibilities before you register as they do not entitle you to a refund. ***** Job Transfer, Schedule change, Moving, Injury, Divorce, Babysitter got a better offer, Not having fun, Physical Injury, etc. etc. etc. No Shows… If you DO NOT show up for scheduled check-in or events, you will be regarded as a NO SHOW and will NOT be guaranteed access to events and will forfeit your payment/deposit. Due to various considerations, 25AO Sports does not allow you to substitute a traveler in your place. If a traveler has a concern, it is their responsibility to notify us via email or in person. Once teams are formed the team members and coach should decide on the best time & location for the majority of the team. MOST teams have multiple practices to accommodate as many practices as possible.i.e. The team may agree on Tue., Thurs., Sat. practices. Some may make Tue. some may make Thurs. But almost EVERY may make SATURDAY’s…If your selected to a team where NO practice day that team came up with works for you, then you come to the league and we will assist you in finding a team who’s practice days work best for your schedule. Mostly all games will be scheduled to start at 2pm on Sundays Beginning Apr. 12th. The final number of teams will determine how long the game day will be. However, we are planning for the last game to be at 6pm. NOTE: Each individual game last up to 60mins. Not ANYBODY can coach! It takes someone willing to make the time and commitment to learning and teaching the game. However, No experience is needed, The league offers COACHES TRAINING designed to equip the coaches with the proper tools to lead a team! [/et_pb_text][et_pb_accordion admin_label=”Accordion”][et_pb_accordion_item title=” What’s So Important About Feb 28th…?”]Saturday, Feb. 28th is the FIRST day of our league wide open practices and clinics.